The WOW Conference is held in the Campus Center at North Seattle College, 9600 College Way N., Seattle, WA 98103. There is a map below on this page and directions. For any questions please contact WOW at wow@womenofwisdom.org, or call 206-782-3363 - please leave a message and we will call you as soon as possible. The Temple where you can purchase a private appointment with our professional Healers, Psychic Readers, and Body Workers. You can register for individual events or weekend packages. Please go to the event schedule page to see the full list of events. Pre-conference registration is available online and by phone. 206.782.3363 through noon, Wednesday, Feb. 15th. Registration is now Closed. You may still call the Registration Desk until Thursday February 16th, 2017 at 4:30pm. Registration will also be available on site during the conference at North Seattle College. Please go to the Registration Information page for full information. Men are welcome to attend all evening events, Thursday, Friday, Saturday and Sunday evening workshops. All other workshops are for women only. Chairs are available in every workshop. For workshops Wednesday, Thursday and Friday, the college cafeteria is open. Friday, Saturday and Sunday we will have a choice of three delicious box (bag) lunches (gluten free and vegan options) for you to purchase. These must be purchased by Tuesday, Feb. 14th. Monday is a special lunch banquet that you need to register for (see conference schedule) unless you have a weekend pass. We will have light snacks, tea, coffee and water available at the conference. If you have dietary concerns or desire a more substantive meal we have prepared a document you can download with a ﻿list of local restaurants﻿ within a mile or so of the campus where you can go for lunch or dinner. The list includes contact information and driving directions from the campus. We have downloadable versions of our parking map for your convenience. You will need a parking pass for events on Wednesday, Thursday and Friday during the day and evening. Do not park in the South west lot, garage or visitor lot before 5pm on Wed. Thursday or Friday. Park in the East lot facing the freeway. You do not need a pass during the weekend Saturday through Monday. Directions: See campus map and conference room maps at the bottom of this page. North Seattle College is close to the Northgate Shopping Center on the (opposite) west side of the I-5 freeway. We are located in the SW corner of campus, near the light at 95th St. and College Way N.
From the south, take Northgate Way exit off of I-5, turn left at the exit light, stay in the left lanes, go up to the light at Northgate Way, cross under the freeway, and go to Meridian Way (just past Nexus Hotel and Saffron Grill restaurant). Turn left, Meridian Way becomes College Way N. Drive south to the light at 95th St. which is at the south end of the campus buildings. Turn left on 95th and take the first right into the south parking lot. If that is full continue to the east lot where there's lots of parking. From the north, take the Northgate Way exit, turn right at the exit light and left at Meridian Way and follow above directions. Evening events on Thursday, Friday and Saturday are in the Conference Room, Gaia (cc1161). Our Conference Center is in "Frigga" (old cafeteria - cc1456), and includes Registration, Conference information, Counselors, Poetry Wall, Community/social/lunch area, Networking, Silent Auction, Market Place, Temple and Art Show. When you arrive at the conference you will be directed to your workshop room. Personal recording of events is not permissable. Are available on these days: Saturday and Sunday 9:00am - 6:00pm and Monday 9:00 am - 1:30 pm. Our professional counselors are available for guidance, crisis intervention, and processing your emotions. There will be a sign up sheet in the counseling corner of Frigga's Hall near the Temple. We at WOW are so excited about the conference and we love the creativity that is expressed by you lovely wise women, so be sure to share some of your creativity with all of us. The poetry "wall" is in Frigga, our conference center. 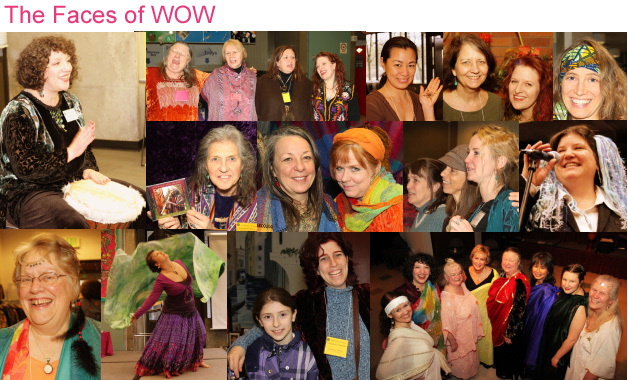 This year, our 25th, will have a wall for you to post your reflections and gratitudes about WOW! You can compose a masterpiece, a lovely scribble, or bless us with a Haiku. Art materials will be provided to use. Have Fun!